Twingly is gone on several media, Dagbladet and Se & Hør among others. What is happening? 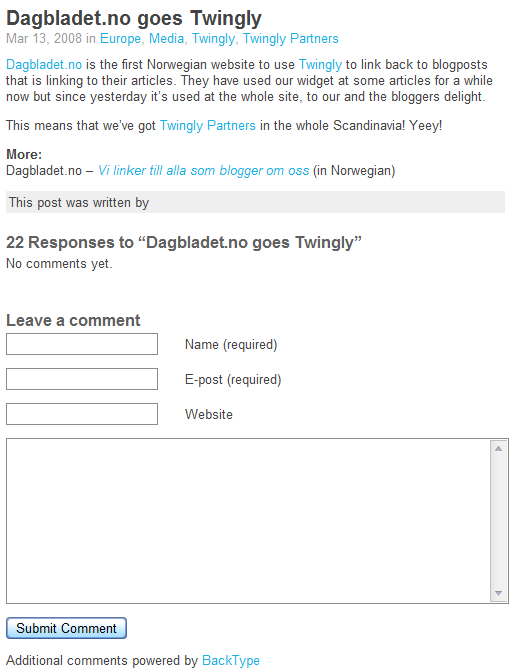 On Twingly’s blog people started to question, especially on Dagbladet’s post, suddenly this is the way the blog post looks, mysterious? This is just like Entrecard does it, if anything bothers them – delete it. When will Internet companies learn that people who use the Internet want it to be open? We know what happened to Entrecard. .-= sixmats´s last blog ..Kumamoto Part 4: Fujisaki Hachimangu Festival =-.